Our range of products include printed designer kurtis, indo hand block printed western kurti, hand block fashionable kurti, girls block printed kurti, block printed kurti and quilted hand block print stylish long top. We are manufacturers, suppliers, exporters and wholesalers of elegant and vibrant Printed Kurtis. The stylish design, piped hemline, attractive eye catchy colors make them popular among our clients. Customers can avail these from the market at very affordable prices. These can be paired with any kind of pants, jeans, trousers or leggings to give them a complete look. All raw materials are genuine and quality assured. For this we pass all our products through quality checks from time to time. Our company is engaged in providing superior quality Indo-Western Kurti to our most reliable clients. These Western Tops are appreciated by a large number of estimated costumers due to high quality and durability. These Western Top are available in market at most affordable rates. 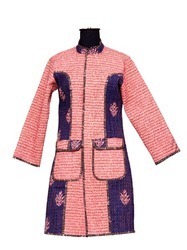 We are engaged in offering Hand Block Fashionable Kurtiin various colors, prints and fascinating designs. These Kaftans are easy to wear and comfortable full length garments, widely demanded in the global markets. 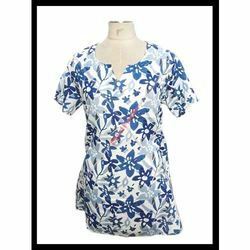 By keeping track with the current market development, we are involved in offering optimum quality Girls Block Printed Kurti.Our offered ladies kurti is fabricated with the aid of our trained designers who have vast knowledge of market latest trends. We use only best quality fabric along with advanced techniques for fabrication process, with the international quality standards. 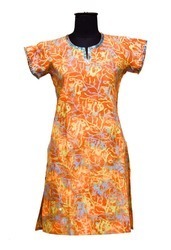 Additionally, we offer this ladies kurti in various colors, styles, and designs. Owing to our vast experience in the concerned industry, we are offering a wide-ranging array of Block Printed Kurti. 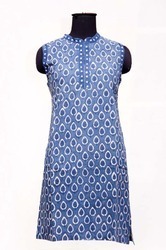 The printed kurti provided by us is tailored using superlative quality fabrics and progressive machinery. Our offered Printed kurti is checked by quality experts so as to ensure its flawlessness. This printed kurti is comes in variety of designs, color combinations and patterns as per the needs of clients. Our good quality products make us a major manufacturer, supplier, exporter and wholesaler of Quilted Hand Block Print Stylish Long Top. The Cotton used in their production has a good sheen and wrinkle resistance to some extent. They are perfect for customers who want trendy clothing and keep themselves warm at the same time. Our products are easy to wash and require no maintenance. Looking for Hand Block Ladies Kurti ?